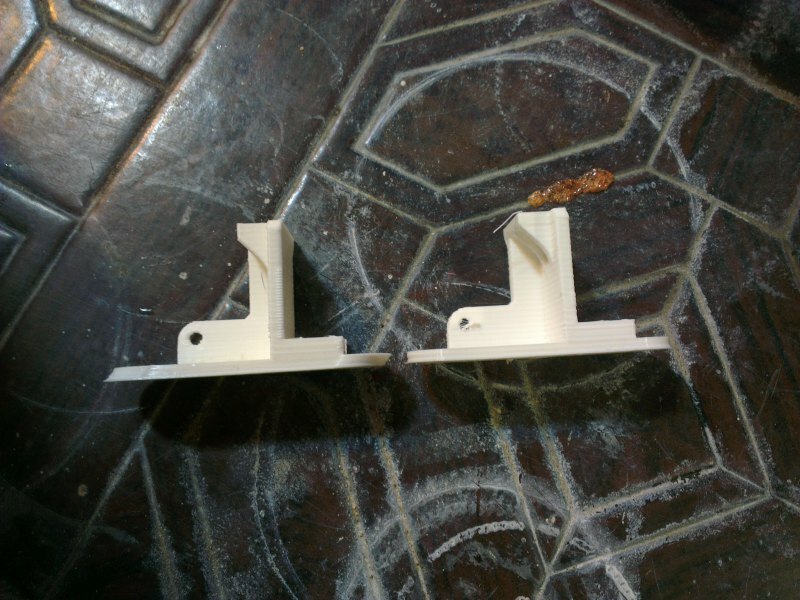 These aren't designed to drive 3d printers so a little fiddling was required to make it work. X, Y, and Z on the machine matched up with the respective outputs on the board. 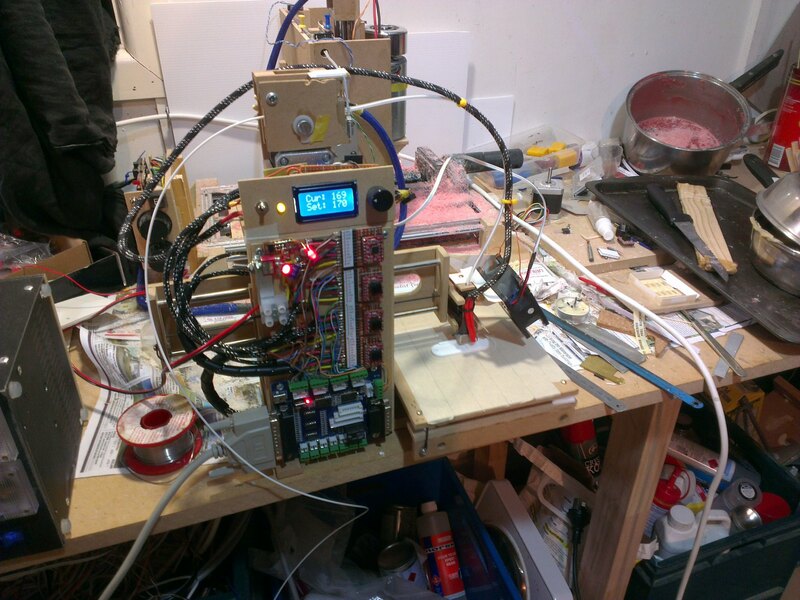 The extruder was hooked up to the A axis, and the limit switches plugged straight in. That just left the heater on/off output flag for the heater, and the same signal for the fan. 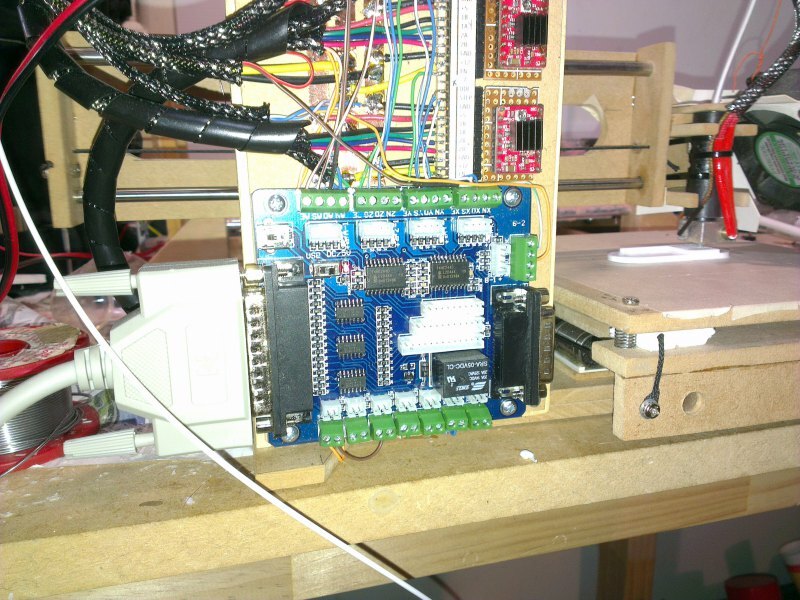 I wired these up to the B axis step and direction pins, and wired up a mosfet for the fan so I had speed control. Get a linear axis for the extruder. I set this up as the U axis. Attach the fan to something. I set it up as a spindle so that an M3 S255 command would turn the fan on to 100%, while M3 S127 would give 50% power, and so forth. Attach the heater to something. Since I wanted complete control over the heater with no risk of a firmware bug causing the heater to get stuck on, melting the fairly expensive hot end, I originally made the heater as a separate standalone control board, with its own readout and temperature control knob. All it requires is a TTL signal to turn it on or off. So that was easily hooked up to the "coolant mist" signal in LinuxCNC. With the hardware hooked up, limits entered, homing values corrected, and steps per mm calibrated, I now had a mostly functioning machine. 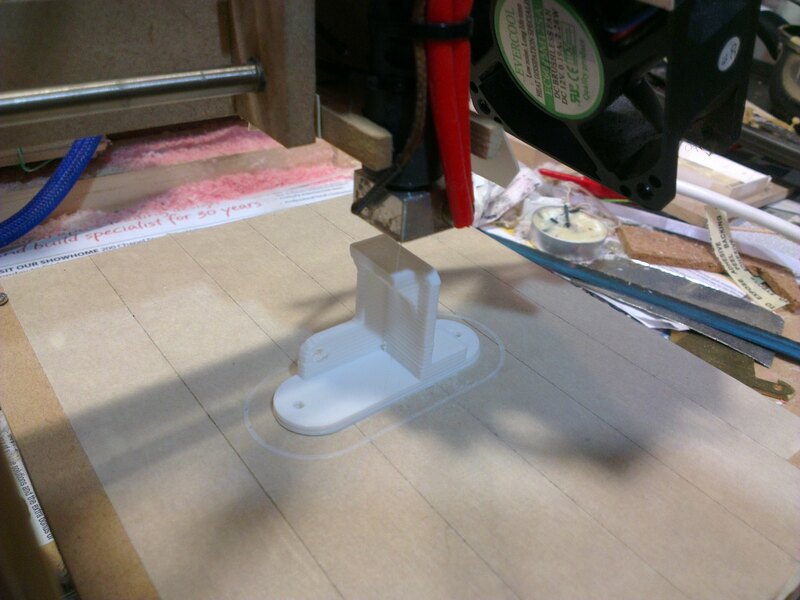 Changing the extruder axis to U. This can be done in the Slic3r ini file. 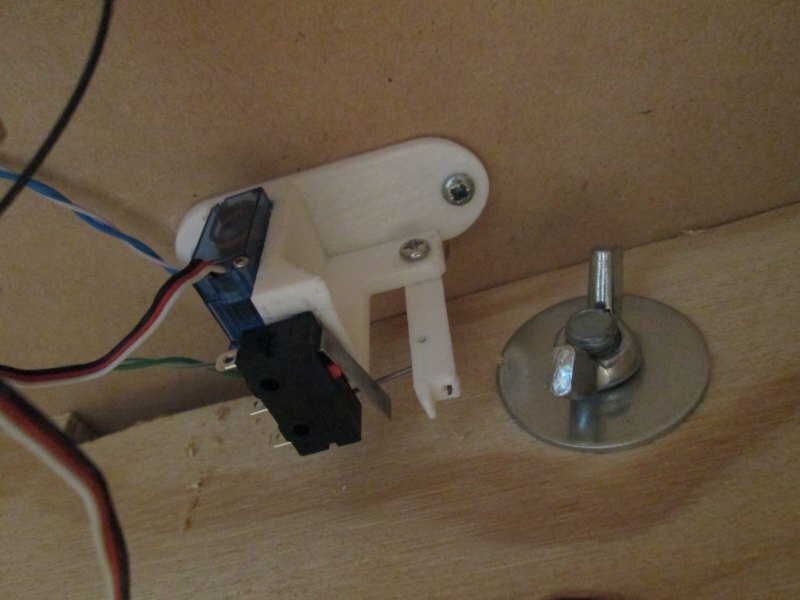 Changing the fan on/off codes to spindle commands. Easily done with a sed script. Removing the M82 "absolute coordinates" M code. Changing the heat codes to coolant codes. .. which handles the quirks of converting Slic3r into LinuxCNC GCODE. How does it work? Well, it is fast. It is too fast in fact; the poor upgraded extruder motor just can't shove enough molten plastic out the nozzle fast enough! So I have to run it at 50% speed, or print less plastic each layer. Printing less plastic each layer means printing smaller layers, which gives better quality, so that has been a nice benefit, as now I can print t higher quality, significantly faster than before. And has it fixed the problems from before? Old is on the left, new is on the right. So yes, it has. The rubber bands that clamped the filament against the extruder wheel perished over the summer, so I replaced them with a couple of old printer springs and a cable tie. Hey, it works! Superb...A true DIY machine.. With love from India.. I'll have two print some invaders. I just blraey finished repairing my heated print bed, and it'd on it's first-second trial run. We'll see how it goes. As for the makerbot extruder, we have become mortal enemies. I ended up buying some components from another company and they worked like a charm. The design has a lot of flaws in it. The one that comes to first to mind is the thermal barrier. This is the thing that keeps the extremely hot barrel and nozzle from melting the device it's attached to. Makerbot supplies one made out of teflon (PTFE), and teflon is a very soft material. What happened to me (on two teflon barriers) is the barrel wasn't screwed in tight enough (because it's so soft, you don't want to screw it in too tight, or you damage it) and hot plastic got in there and made it impossible to use. The barrier I used is PEEK, it's tougher. It worked beautifully the first time. The alternative option I used was just so much smoother that I've nearly sworn off makerbot alltogether. Hi Jamie, usually the shipping is free! Just came across this site and had a nice binge on the archives. Good job on the CNC and printer! What's shipping like to NZ from ebay? I never considered doing that.